Now, Cornwall is a very beautiful county but getting there when you live near London is a bit of a chore. The championships are held in the Eden Project near St. Blazey which in itself is always worth a visit but your heart does tend to sink when you plug the co-ordinates in to your SatNav and you realise it is at least a five hour journey from your home. Nevertheless it had to be done and a small detour to Basingstoke to pick up the venerable Mr. Robinson, left a mere 199.1 miles to travel at 5am in the morning. For those of you who have never visited the Eden Project, it is a fantastic place. The site is a former mine which has been filled with numerous ‘biomes’ which house some amazing flora and thanks to some invading local Sparrows and Robins, fauna. 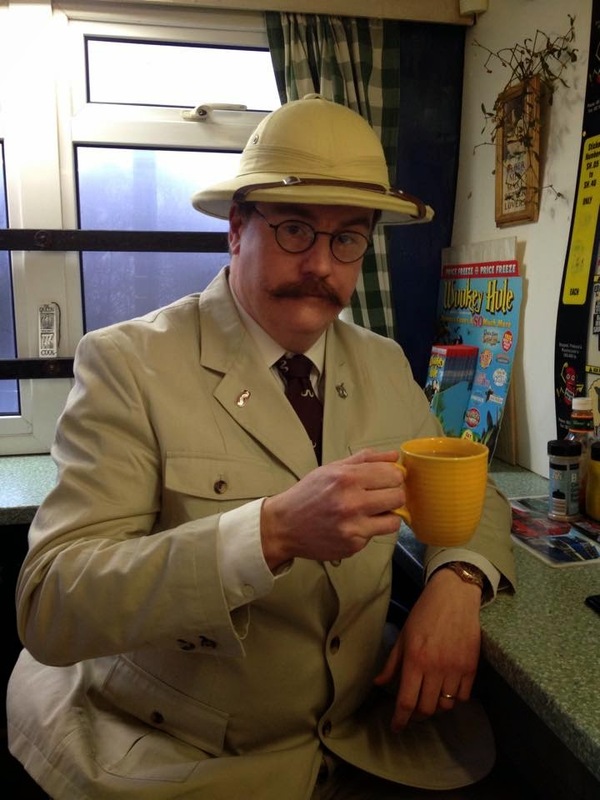 Knowing that there was an equatorial section, the decision was made to dress up for the occasion – pith helmets and safari suits, just to fit in with the plants, you understand. However, getting there proves quite a slog and I would recommend would-be visitors a stop over nearby or combining it with a holiday in this wonderful area. In any case, as you haul down the South West it is almost obligatory to stop at Annie’s tea bar where the A303 runs in to the A30 for a strong cup of tea and a bacon sandwich (featured on the recent BBC documentary about the A303). They did not even bat an eyelid at two simpletons dressed up for the day emerging from the Somerset fog, across the lay bay car park at some God forsaken hour. 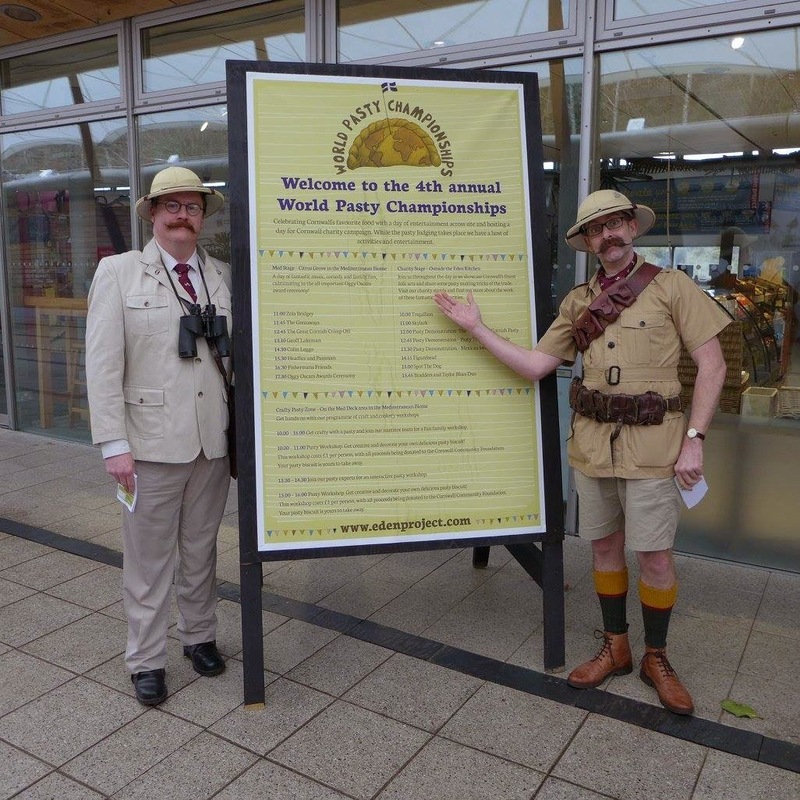 On arriving at the Eden Project, we had set ourselves the task of meeting up with Richard Shaw of the Twisted Pasty Co. who had a rather unusual entry in the competition. 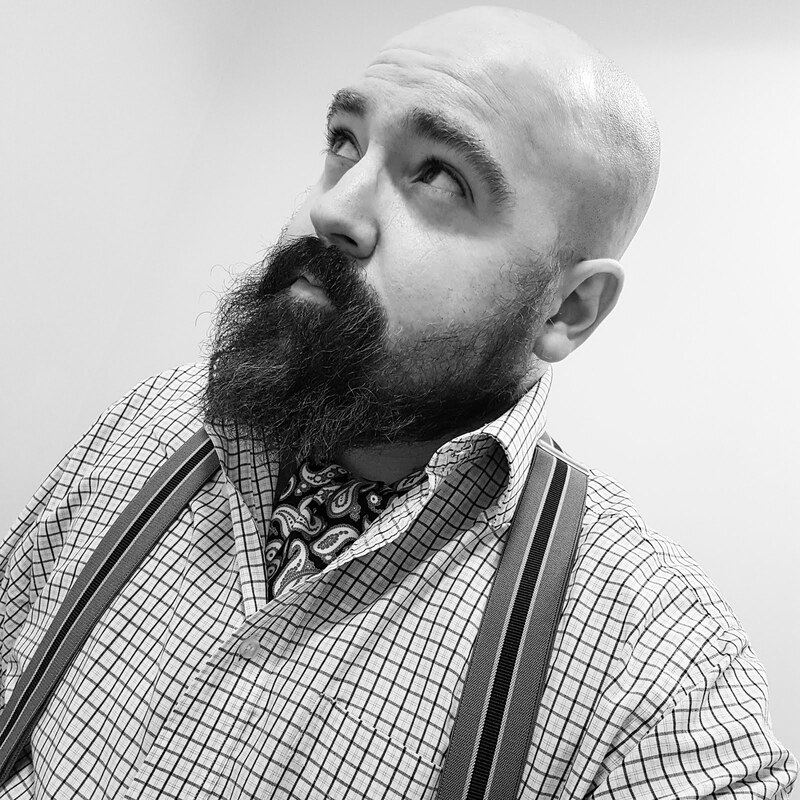 Richard is well known to the membership of the Handlebar Club and whilst he does not have any facial hair himself, he is a supporter and makes some of the finest pies and pasties around. 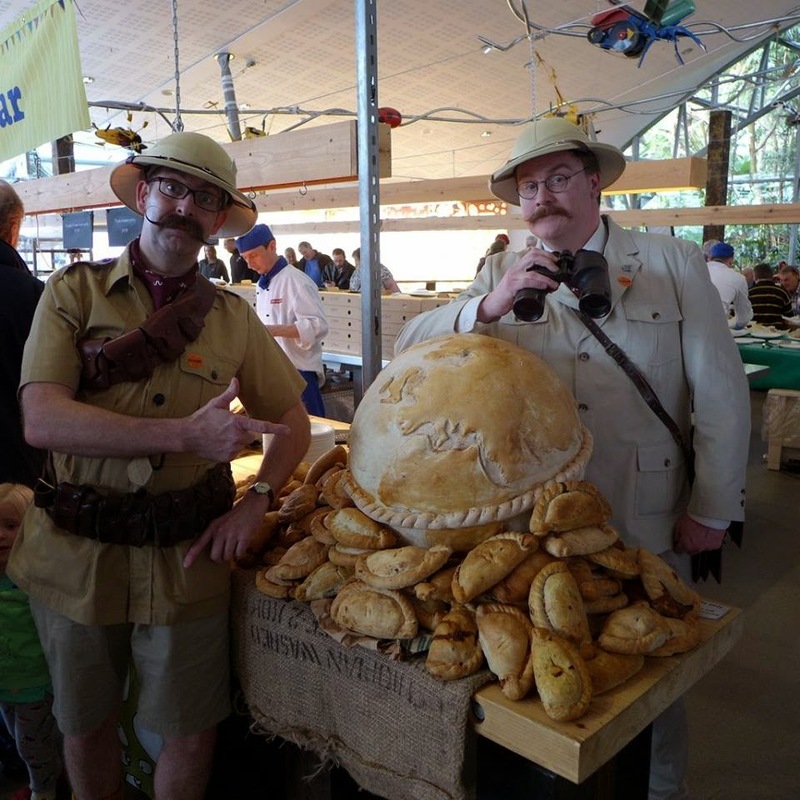 What set Richard apart from the field this year was that he had made the most expensive pasty in the world as a show piece which would later be auctioned off for charity. The pasty contained some very fine and rare Japanese beef amongst other epicurean delights, and if sold on the open market would retail at around £235! Another splendid invention by Richard was the snail pasty featuring, yes you have it, snails in a white wine and garlic sauce. Not something that the author and his companion were overly keen to eat but the novelty value had to be commended. Looking down from one of the balconies, the entries to the competition were numerous and the judges were taking the tasting very seriously. An awful lot of local pride seemed to be at stake and entries had indeed come from around the globe. 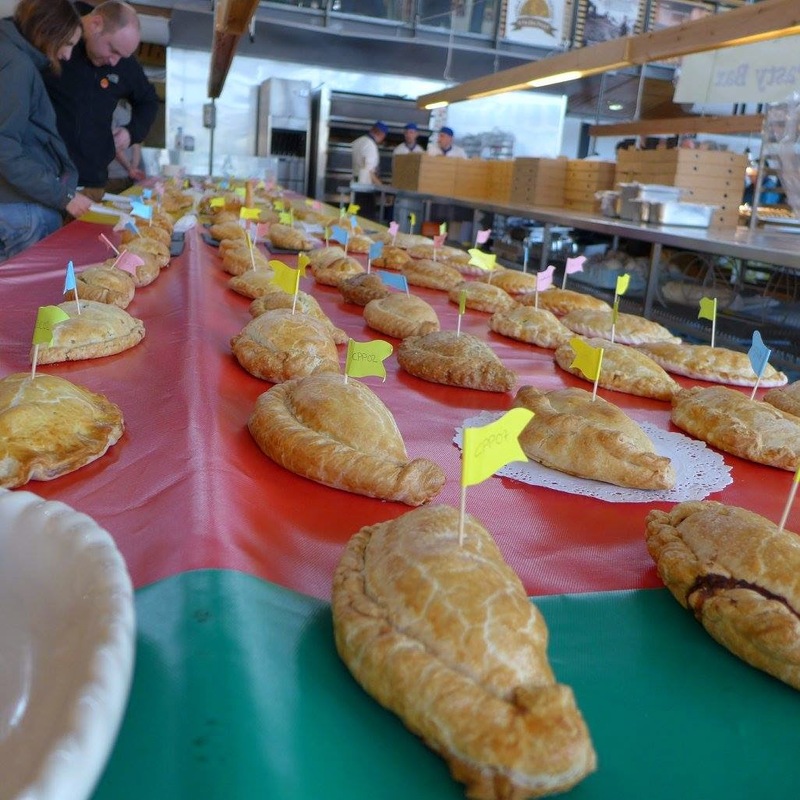 One pasty that caught my eye was based on another Cornish delicacy: the ‘Stargazy’ pasty. Thanks to the miracles of the internet, I will let you discover the legend behind the famous pie of the same name. In any case, there was a slight disappointment to the day in that despite all this glorious fayre being right under our noses, the pasties were not for consumption by the general public and we enviously had to look on whilst a chosen few sampled and gorged their way through the many rows of Cornish goodness. Sadly, the Eden Project pasties that were for sale through their cafe were not up to our standards and despite costing a mighty £4.95 each, were quite dry and flavourless and really did not hit the mark. However, all was not lost as we enjoyed all the sights the Eden Project had to offer and goofed around in the plants much to the amusement of the local press (we made the Cornish Guardian!) and a group of disabled children who were having a splendid day out. Being mischievous by nature, we did fool some non UK tourists by telling them we lived here permanently and I can only wonder what they told their families when they got home. Well, I don't know about you but my stomach will not be satisfied until it has made the acquaintance of a pasty. Excuse me while I visit a nearby bakery forthwith.